U.S. June auto sales beat expectations (16.9 million vs. 16.4), and have extended their impressive 5+ years of recovery. Sales are now back to the average level of sales pre-recession, and they are likely to move higher over the next few years as consumers gradually upgrade older vehicles, and jobs and incomes continue to expand. 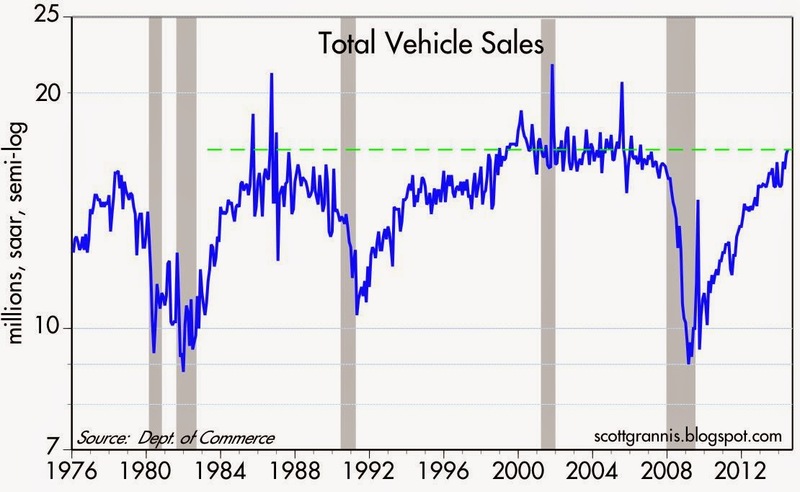 The current recovery in auto sales is of similar magnitude to what we saw in the go-go 1980s. It doesn't get much better than this. 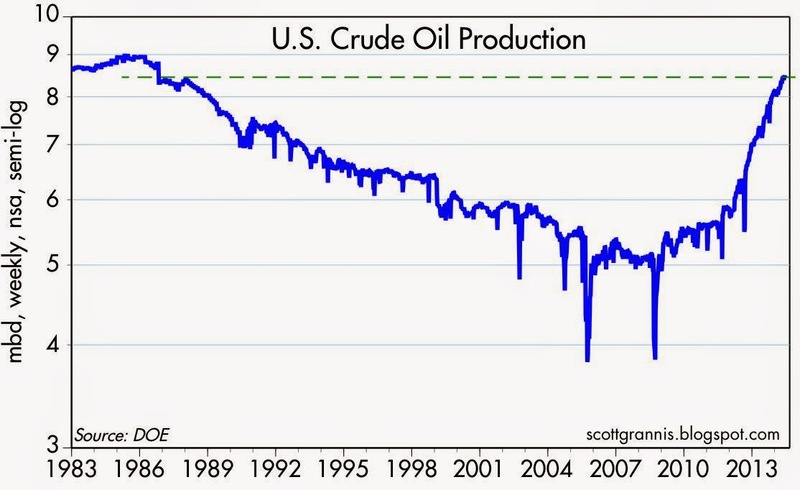 U.S. crude oil production has also experienced a huge recovery in the past six years. This is a huge change on the margin whose eventual impact on the economy is difficult to over-estimate. We begin our journey back to the U.S. in a few hours—it will take almost 24 hours to get home from where we now are (visiting friends in Cordoba). Despite all its problems (inflation, corruption, and terribly misguided economic policies), visitors to Argentina can enjoy wonderfully friendly people, and fantastic food and wine. Thanks to the huge devaluation of the peso in the past six months, delicious steaks go for $6, and you can get an excellent bottle of wine for $10-15 at most restaurants. If you're traveling here, be sure to bring cash (clean $100 bills are preferred) in order to take advantage of the "blue" exchange rate which is currently about 12 pesos/$. (The official rate is 8.15). You can find the blue rate here, which is from the La Nación newspaper (hover your cursor over "Dólar hoy" in the upper right hand area of the page). Many restaurants and hotels will take U.S. currency at that rate, and if you ask around you can find agencies willing to exchange pesos for dollars at that rate. You won't get that rate at banks or ATMs however—just the official rate. At $100 barrel the USA crude (and condensates) story may have a lot of legs...the experts have under-predicted production consistently...amazing story...but ethanol will survive, fear not corn farmers! ECRI’s U.S. Future Inflation Gauge (USFIG) rose again in June. The value of the USFIG lies in its ability to measure underlying inflationary pressures and thereby predict turning points in the U.S. inflation cycle. "With the USFIG trending up and hitting a 70-month high in June, underlying inflation pressures have risen further." The Eurozone Future Inflation Gauge (EZFIG), published by the Economic Cycle Research Institute, rose to 95.3 in May from 94.0 in April. "Euro zone inflation ticked up in the latest reading," said Lakshman Achuthan, ECRI's chief operating officer. "With the EZFIG rising further in May to a 25-month high, euro zone inflation is likely to bottom out in the coming months." Last month, the ECB launched a slew of measures to fend off the risk of deflation. The University of Michigan sentiment survey’s index of current conditions, which measures Americans’ views of their personal finances, increased to 96.6 this month from 94.5 in May. The preliminary reading was 95.4. The gauge of expectations six months from now was little changed at 73.5 after 73.7 the prior month. The initial reading was 72.2 for June. Other measures of consumer sentiment have improved this month. The Conference Board’s index climbed to 85.2, the strongest reading since January 2008, from 82.2 in May, the New York-based private research group reported earlier this week. The Bloomberg Consumer Comfort Index last week held near its 2014 high as views on the economy were the second-strongest since 2008. I'd bet that price inflation of cars is really high. I have been in the market helping someone buy a car. I am staggered by the high prices of new cars. How do they get away with that? Just extend the loan to 6 years. I am further amazed how low the interest rate is for this low FICO individual. I don't see how this helps. Moreover, I am amazed at how skillfully marketing people in most industries have become in finding out ways to maximized prices. If inflation will bring in some competition I guess it would be helpful. But I doubt we will see competition increase in major industries. Hey, 17,000 on the DJIA! But come on! A barrier has been crossed. And valuations are not whacky.